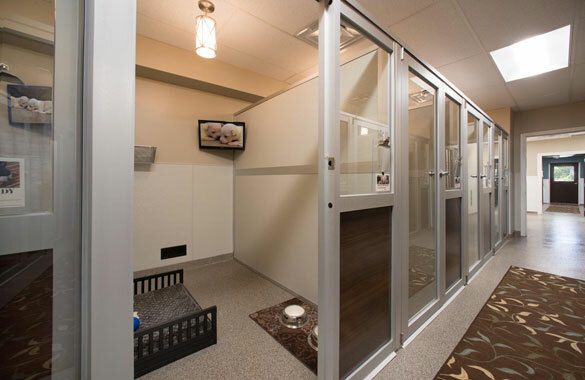 At ABC Pet Resort, we provide exceptional boarding accommodations for dogs in The Woodlands TX and the surrounding metro Houston area. Our goal is to provide each guest with a comfortable environment and loving care. All dogs are assessed daily by our lodging technicians to assure each guests' exercise, eating and resting needs are met. Three outside elimination times are scheduled daily and additional potty walks can be arranged for dogs with special needs. Another critical component to proper care is the close relationship our techs develop with pet guests. Spending quality one-on-one time and forming personal bonds creates happy campers, who are eager to return to ABC! Rates start at $28 per night. All lodging areas have gorgeous epoxy floors that are bacteria resistant, as well as slip resistant - which is wonderful for older dogs. VIP Suites & VIP Suite Patios: Our luxurious VIP Suites are equipped with large, comfy orthopedic beds. During the day, personal flat-screen entertainment is available to amuse each guest. No mindless TV, just fun dog videos, designed to capture a dog's attention with interesting animals and sounds. At night, calming music designed for dogs is played to ensure a great night's sleep. Also included with a Suite stay, is a daily personal play activity with one of our Activities counselor. Suite Patios sport easy-slide guillotine doggie doors leading to their own private canine turf patio. Your dog will lounge in style and comfort in our VIPs! Zen Den: Specifically designed to comfort and calm our aging, sensitive guests. Faux wood privacy paneling separates them from the hustle and bustle. Den Patios: Den Patios have beautiful glass fronts and easy-slide guillotine doggie doors leading to a private patio. Dens: Our Den areas provide a safe and comfortable environment with raised hammock-style bedding platforms. We welcome your pet's own bedding, which we can place on top of our platforms. A climate-controlled HVAC system for your dog's comfort. Antimicrobial partition panels between guests for safety & privacy. Individual potty breaks three times daily in secure fenced areas. Patio accommodations with access to private yards throughout the day via a doggie door will also be taken to a larger exercise yard daily to ensure they get proper exercise. Extra activities, including group play, are available to customize your dog's stay. Victor premium grain-free pet food is served according to your dog's normal schedule. Eco-friendly & sanitary Kleanbowls are used for all meals - stainless steel rims with bio-degradable liners. 10% off each additional pet sharing the same enclosure - must be compatible to eat together.